The REST APIs provide access to the tenant data of the Plantronics Manager Pro cloud service, containing product data and events for the particular customer tenant's UC infrastructure. The data is returned as JSON and is suitable for importing into analytics suites or presenting the data via custom front end apps, etc. This sample provides a very basic illustration of that, converting the returned JSON to a simple HTML report on a web page. 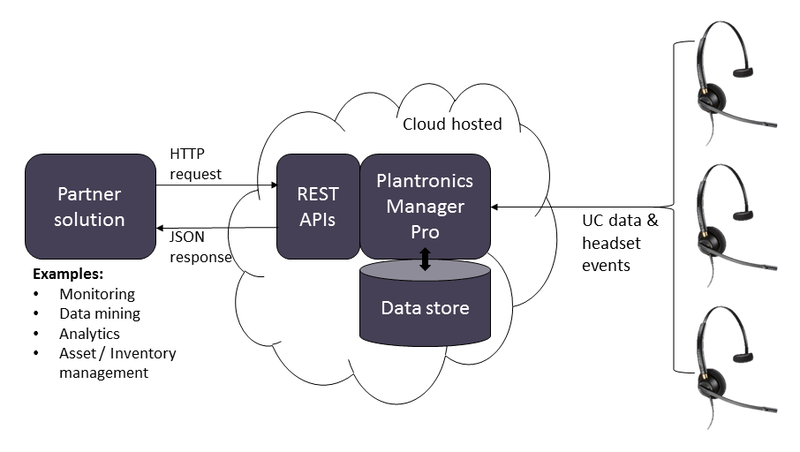 The below diagram shows how a partner solution is able to connect to the Open Data Access Rest APIs and query the data held in the Plantronics Manager Pro cloud platform. This new sample code illustrates how to consume data from the Plantronics Open Data Access APIs, in this case the REST API endpoints. If the REST API call is successful, the result is transformed into an HTML list of items, otherwise on error it displays the reason for the error.